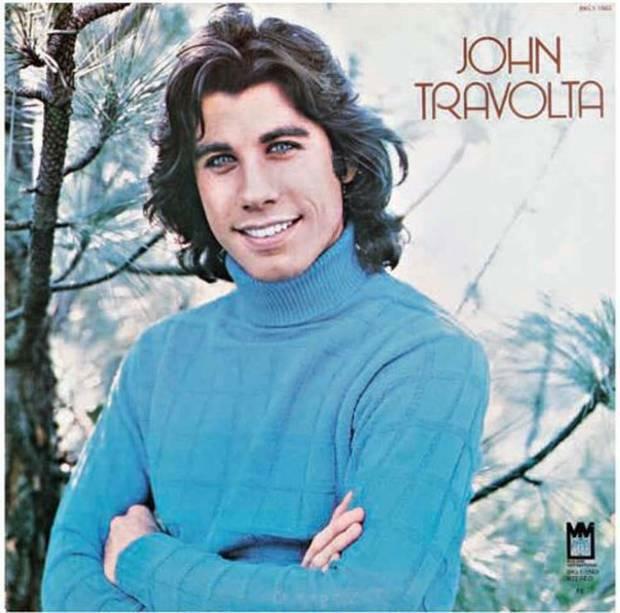 No matter how many iconic roles John Travolta takes on in his career, there are a few of us who will always prefer to remember him not in a white disco suit, with a skinny tie, or even donning a housedress, but in a turtleneck. Which can only mean that, on the occasion of his 60th birthday, we come to celebrate John Travolta, music star. It's true that he hasn't exactly been emphasizing his pop aspirations since 1977, the year when he released his second and last full solo album. Yet, as Edna Turnblad would attest, even without attempting a Top 40 career in earnest, he can't stop the beat. Whether he's singing and dancing on screen ("Grease," "Hairspray") or just one of the two ("Saturday Night Fever," "Pulp Fiction"), we associate him with musical moments more than any other contemporary actor. Which makes his once-a-decade-or-so efforts as an Actual Recording Artist all the more fascinating and sometimes puzzling. Maybe it was the way that Travolta sang "Barbarino" to the tune of "Barbara Ann" on an episode of "Welcome Back Kotter" that convinced a record company to take a chance on the then-TV star's crossover appeal in 1976. The single "Let Her In" went up the nation's nose with a rubber hose, if not quite to the top of the charts, peaking at No. 10, his best position for a non-show tune. A second and final album, "Can't Let You Go," found interest in his pop career waning in his pre-"Saturday Night Fever" period, with the LP peaking at No. 66 and the single "All Strung Out on You" only good for No. 34. If nothing else, though, the album sleeve established that he and Prince may have been separated at birth. But he was again able to capture greased lightnin' in a bottle with singles derived from the 1978 "Grease" soundtrack, most notably "You're the One That I Want," which gave Travolta his sole No. 1 hit. Speaking of "e-lec-tri-fyin'!," "Grease" was preceded by "Saturday Night Fever," which gave the world a couple of great makeshift music videos — one of Travolta merely walking during the opening credits, another with him on the dance floor — even if it was Barry Gibb doing the soundtrack jive talkin' and not him. Fully established as a leading man, Travola laid off his pop chops in the '80s — wisely, some would say, considering the wan reception given his one recording during the era, a poorly received duet with Olivia Newton-John on "Take a Chance," from the soundtrack of their non-musical flop "Two of a Kind." Their early-MTV-era video for the 1983 tune is notable only for the stars' mutual mullets and the entire production budget appearing to have been blown on a ladder. Travolta stayed out of musical trouble for nearly a quarter-century after that forgotten debacle, save for a couple of fleeting appearances on the 1986 Scientology album "The Road to Freedom," which had him trading lines with the superstar likes of Frank Stallone, Karen Black, and Leif Garrett. Yet he still managed to seem like a movie-musicals star even without appeared in a real one, thanks to his hoofing in "Pulp Fiction." His cross-dressing turn in 2007's "Hairspray" finally offered a legitimate excuse for his not-quite-masculine, not-quite-feminine singing voice. The year 2008 brought an off-screen soundtrack singing duet with Miley Cyrus for the "Bolt" soundtrack. Neither one of them quite charges through the song like a wrecking ball, so only in our fantasies can we imagine what it would be like if the Travolta who stretched the spandex in "Stayin' Alive" and "Perfect" met the Cyrus who currently can't stop wearing onesies. But it took a reunion with Newton-John to put a real question mark on his pop career. The year 2012 brought an album recorded for his on-again partner's charity called "This Christmas." As critics noted, there had rarely been less heat in any duet of "Baby, It's Cold Outside." And a clip for the original holiday song "I Think You Might Like It" prompted New York magazine to publish a column titled "Ten Things That Creep Us Out About John Travolta and Olivia Newton-John's New 'Music Video'." Travolta's chin hair managed to claim two of the 10 spots, although the particulars of his folliculars probably deserved at least four. Though fans appreciate these one-offs with Olivia and Miley for their novelty or even perverse value, is it too much to hope that he'll rock a violet sweater again and rise like a feather-haired phoenix to make another solo album? Well, yes it is — he doesn't want to give up another shot at an Oscar that easily. But if we're never going to get another "Sandy," we'd settle for a reprise of the Watusi.